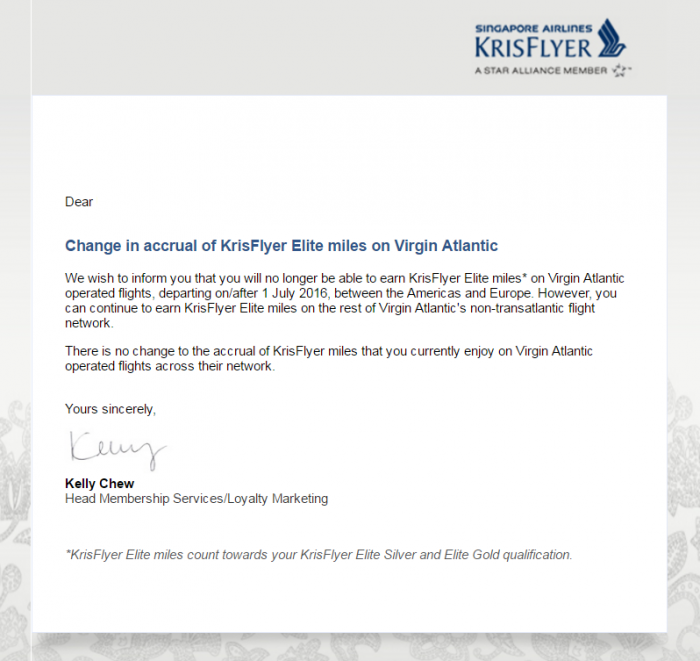 Singapore Airlines sent out an email today to KrisFlyer members alerting them to changes on elite miles earnings on Virgin Atlantic that will take place on July 1, 2016. KrisFlyer members are not able to earn elite qualifying miles on Virgin Atlantic Americas flights starting July 1, 2016. This won’t affect earning of award miles for those flights. You can still continue earning elite miles on all other Virgin Atlantic flights. You can access Singapore Airlines KrisFlyer webpage for partner airlines here. It is unclear from the announcement how this will affect flights to the Caribbean. This change must be derived from the Singapore Airlines sale of their 49% stake of Virgin Atlantic to Delta Air Lines a couple of years back. Virgin Atlantic and Delta now co-operate flights between the UK and United States. They must feel that awarding elite miles for KrisFlyer members on these flights is not a prudent choice.